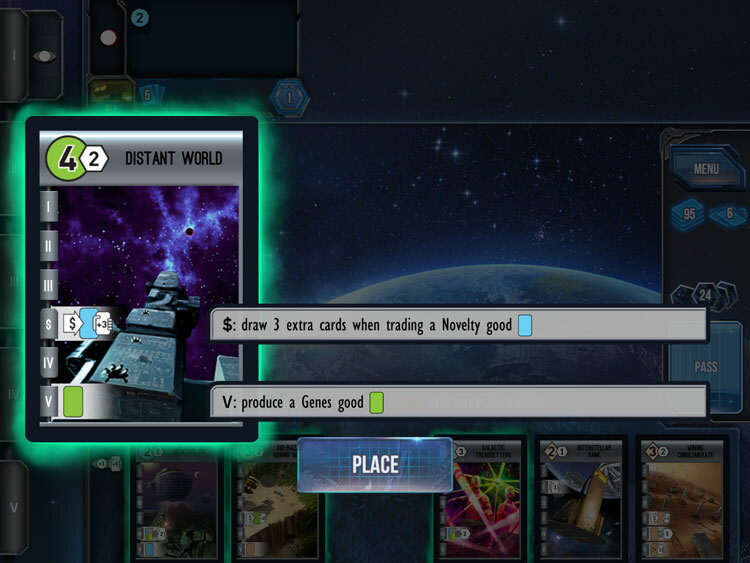 We review the iOS version of Race for the Galaxy, a tableau building card game. Now available on your iPhones and iPads, this is an excellent translation of Race for the Galaxy, so much so that I don't ever need to play the physical version again. Race for the Galaxy is in no way a new game. Yet that hasn’t done much to diminish its popularity. This card game debuted back in 2007, and a decade later, it’s finally making its way to our tablets. I actually owned a copy of Race for the Galaxy many years ago, but it eventually made its way to the trade pile due to its crippling reliance on iconography in the game. If you didn’t play the game often, it was a pain to get to the table. 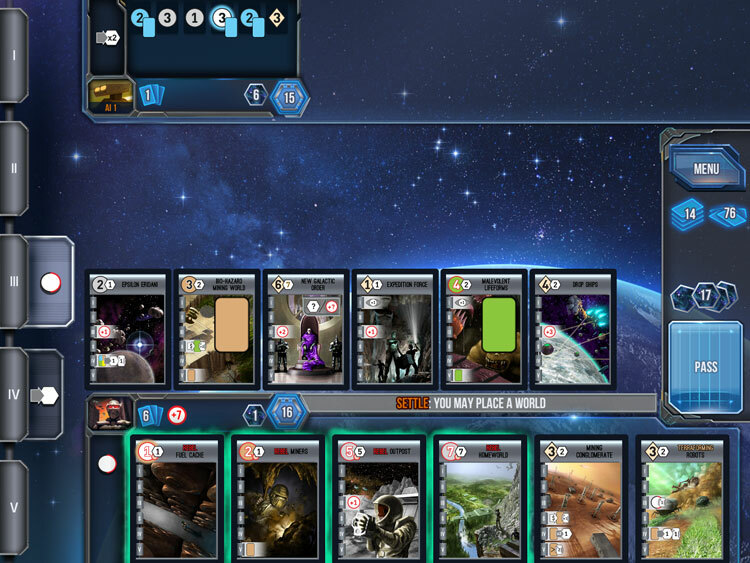 With Race for the Galaxy now available on iOS, I was curious if the jump to the digital realm could not only reignite my enjoyment for the game, but if it cured the learning curve. Let’s find out. 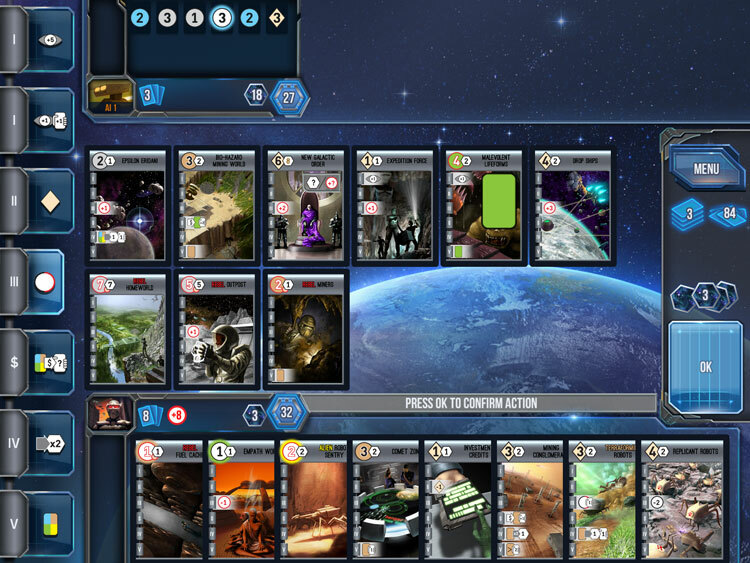 In Race for the Galaxy, each player is creating a galactic civilization by playing cards into a tableau in front of them. The cards represent various worlds they are settling (or conquering) and technological achievements. The main goal of the game is to score the most victory points by the time someone either plays their 12th card, or the VP chip stack runs out. Gameplay is handled via action selection. Each round, every player secretly selects one of 7 roles (which range from drawing cards, to playing cards, to activating planet powers), with all players taking the action from that role. However the player that chose the role gets a special bonus. I love the fact that the cards are automatically explained when you zoom in. While no digital translation is ever perfect, Race for the Galaxy comes pretty darn close. Once you are into the game proper, the thematic interface is expertly laid out. At the bottom of the screen is your hand of cards. Cards will also glow when they can be played into your tableau (meaning you can actually pay its cost and at the right time). A simple double tap of any card will expand it for a closer inspection. The best part about this feature is not only does the card get larger, but the game automatically overlays text explaining exactly what the card does. The icons are still there, there is just always a full text explanation as well. The top of the screen houses your opponents, you can tap to bring up more information on their empire should you desire. 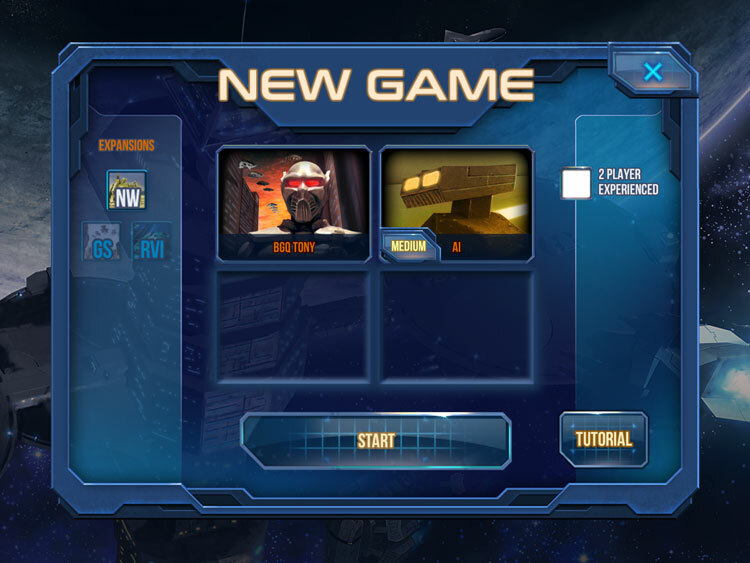 Action selection is handled via taping the boxes on the left side of the screen. These can also be double-tapped for an explanation of the roles and their associated bonuses. When decisions are made, the app will ask you to confirm your selections. Mistakes can be undone via a handy undo button. Finally, the “spacey” sci-fi music fits well with the app and hasn’t gotten annoying even after more than a dozen games. Cards will glow when you can legally play them, and have enough cards to pay their cost. While I used to own Race for the Galaxy, it’s been a LONG time since I’ve played it. As mentioned above, the reliance on iconography made this one too hard to get to the table. So I was coming into the app with some ideas of how the game worked, but I was more or less still a newcomer. Thankfully, the app included a multi-part guided tutorial to teach the basics of the game. While it didn’t go in-depth on everything; it did give me a solid understanding of how the game is played. I am always glad when board game apps walk me through how to play. There is also an integrated rulebook for those looking for more of the nuts and bolts. The AI programming in Race for the Galaxy is excellent. For playing the game itself, there are three levels of AI to choose from: Easy, Medium, and Hard. Let me tell you, I don’t think I’ve ever seen a developer so thoroughly nail AI programming. The Easy AI is just what it sounds. Great for new players looking to get their feet wet. Eventually, everyone will move on from this setting. The Medium AI is actually fairly competent. While I can still regularly beat it, I do get an occasionally loss (which rarely happens against most Hard AIs in other apps). However the Hard AI is definitely billed correctly. It’s good, really good. It will take a skilled player, and most likely some luck to beat the Hard AI with any kind of regularity. Myself, I stick with medium as I’m not that good at Race for the Galaxy. When you have a solid feel for the game, you can hope online for some multiplayer. This can be handled either in real time or via asynchronous play. Using friend codes (Wii flashbacks anyone? ), you can add other players to your friends lists and challenge them. However these oddly appear to be device independent, so you’ll need to add the same person twice if they are switching between phone and tablet (the Dev does say that cross device syncing is in the works). 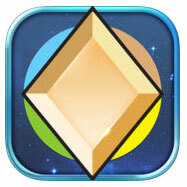 Update: Temple Gates says cross device syncing is coming June 27th. Speaking of phones, you are really going to want a tablet to play Race for the Galaxy. While it is perfectly playable on an iPhone, you will be doing a lot of zooming and squinting to see everything. Unless you have the icons or card art memorized, it’s going to be a bit of a hassle. I wouldn’t even try to play this game on an iPhone SE. Finally, if you decide you like the Race for the Galaxy app, there are already a few expansions for sale as in-app purchases. Priced at $3.99 each, I think they are both good adds for anyone who’s enjoying the app and want a deeper experience. The app will handle all the heavy lifting for you, and ask you to confirm any permanent choices. This translation of the Race for the Galaxy app is about as good as it gets. While I can dig up some flaws to complain about, most of them are going to be super nitpicky. This is a solid port from start to finish and has absolutely killed any desire for me to own the tabletop version of the game. The full explanation of card abilities when you zoom in is a godsend and makes playing Race for the Galaxy a breeze. Playing the app, either online or against the AI is incredibly enjoyable and I find myself constantly popping in for a quick game. If you are a fan of Race for the Galaxy, or even just were curious about it, this is the app to own. It plays smoothly, has multiple levels of AIs, and online play works great (and is even getting better). This one is a must own. 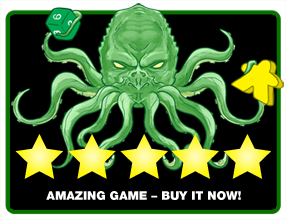 Final Score: 5 Stars – A stellar translation of a good card game that’s an even better playing experience than the physical game it’s based on. I do have an iPhone SE and it works fine! I must admit that I can quickly see the icons and understand what they are, so unexperienced players could have a hard time seeing things. But yeah, the tablet experience is so much better!